John Todd at BYS tells me he's closed on the sale of the 28m flybridge motor yacht Go Fourth with Walter Sea at Camper & Nicholsons bringing the buyer. Go Fourth was built by Burger in 1978 and is a typical example of the yard's classic, traditional style. She accommodates six guests in three staterooms – a full beam master suite and two double guest staterooms, all with en suite shower facilities. The saloon is full width and features a study and formal dining room for six guests. Go Fourth had a thorough refit in 2009 with her interior replaced and features rich Honduran mahogany throughout. Since the refit virtually all systems have been replaced or restored. 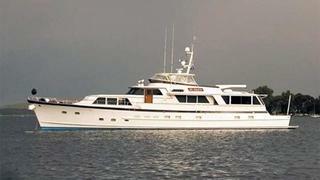 Twin 525hp Detroit Diesel engines give her a cruising speed of 12 knots. Go Fourth was asking $895,000.